I always love it when an email arrives from someone who has read my book “What If It All Goes RIGHT?” Especially when I hear how people are taking ideas from the book and putting them into practice in their lives. Last month, an email arrived that practically knocked me off my feet. I met Susie Leonard Weller 9 months earlier as part of a training I delivered for ministries. Susie was a delight. We hit it off at the training. I assumed she was busy at work bringing small groups to her church. What I didn’t know was that Susie is a Stage 3 Colon Cancer survivor. What I also didn’t know was that 2 weeks after we met, two of her friends from her treatment process who also had cancer died within days of each other. What happened next for Susie is an inspiration to us all and a prime example of our power to turn tragedy into triumph. Check out my interview with Susie this week as she shares her incredible journey into peace, healing and wholeness. 2016 has been a year of transitions and travels! … In March, shortly after completing the book, What If It All Goes Right? by Mendhi Audlin, I felt challenged to apply what I was reading. Mark and I had been dreaming about walking the Camino in NW Spain for several years. We began asking ourselves: What if we stopped talking about it and started preparing for our hike? What if we expanded our trip to see other parts of Europe? We began our plans for a 90-day adventure to Europe to leave on September 11. 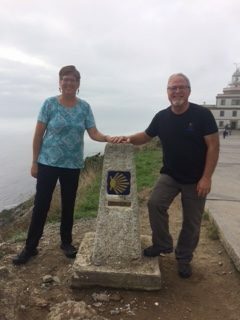 On September 25, we received our Compostela and pilgrim’s shell for walking the last 115 K or 71+ miles along the Camino from Tui, Portugal to Santiago, Spain. In 8 days, we walked about 80 miles through small villages with eucalyptus and pine-scented paths and charming grape vineyards! In October, the adventure expanded to include traveling from Denmark to Croatia. We visited: Copenhagen, Malmo, Lubeck, Halle Hooge, Dresden, Berlin, Prague, Theresienstadt Concentration Camp, Cesky Krumlov, Vienna, Budapest, Zagreb, Plitivice Lakes, Zadar, Split and Dubrovnik. After almost three weeks of solid rain, we basked in the sunshine along the Dalmatian Coast and kayaked in Dubrovnik. In November, we drove from Dubrovnik to Mostar and Medjugorje in Bosnia, to Lake Bled in Slovenia and flew from Zagreb, Croatia to Paris, France to visit our nephew and niece, Chris and Areum Weller. Afterwards, we flew to Faro and enjoyed a week-long rest along the Algarve Coast near Tavira, Portugal. We took a bus to Seville and enjoyed tapas and flamenco. The Mezquita Mosque-Cathedral in Cordova was an architectural delight respecting religious diversity. In December, we flew from Seville to Marrakesh, Morocco and stayed in a beautiful Arabic Riyad hotel within the medina. Snake charmers, loudspeakers blaring Islamic calls for prayer, camel and sheep tanneries within the market inundated our senses. Due to unusually heavy rains, snow and washed out roads in the Atlas Mountains, we took an 8 hour train ride to and from Fes, via Casablanca and Rabat. We wandered through even larger souks with exotic spices and perfumes, a ceramic tile factory and other handicraft stalls. Although it was a long 8-hour drive from Fes to the Sahara Desert near Merzouga, it was worth the effort. Black veiled women walked dusty streets; date palm trees created verdant oases near streams of water; apricot and peach-colored sand dunes rose 450 feet into the sky. 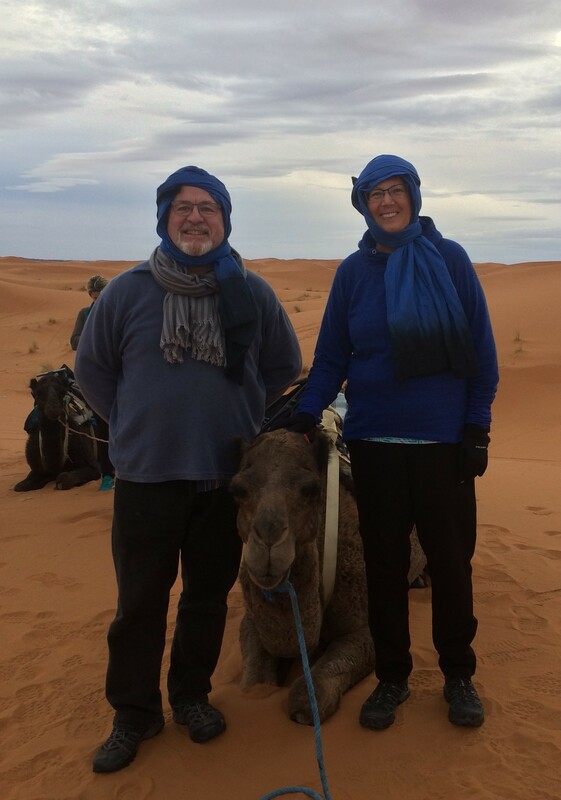 We took a camel trek into the desert and spent one night in a Berber tent. Our hosts prepared a delicious chicken tangine dinner and we drank Moroccan mint tea while listening to African drums and melodies sung by our guides. When I got up at 1:30 a.m. to use the bathroom, I received a surprise gift. The rain had stopped (yes, the rain followed us even into the desert) and the skies cleared up. I stood in awe seeing amazing constellations. Mark and I pulled out our poncho/ground cover and the heavy woolen blankets from the tent and laid them on the desert sand to watch a display of shooting stars. We flew back from Marrakesh to Seville, picked up our larger luggage stored at the youth hostel and took an evening bus to Granada. The architecture, intricate mosaic designs, water viaducts, and gardens in Alhambra are truly remarkable. On the 10th anniversary of my cancer diagnosis and initial colostomy, I dipped my toes in the Mediterranean Sea in Malaga, along the Costa del Sol. I gave thanks for all the resources and support I have received to not only survive, but also to thrive. The next morning, we flew to New York City via an 8-hour layover in London. Within 90-days, we visited 13 countries in Western and Eastern Europe and North Africa. Our travels took us to the Atlantic Ocean, Baltic Sea, North Sea, Adriatic Sea and the Mediterranean Sea. Modes of transportation ranged from taking a plane, train, car, ferry, electric boat, water taxi, trolley, cable car and taxis to walking, biking, kayaking, rowing and riding a camel. We camped in a Berber nomad tent, slept in pilgrim albergues, youth hostels, pensions, hotels, airbnb’s and a riyad. I am reminded that I have a choice every day for how I will handle what comes my way. Even though I often catch myself fearing the worst, I am only a thought away to change my perspective. I am invited to trust that my “What if’s” could all go right. And, even if the circumstances are not desirable, nor comfortable, I can choose to find meaning and purpose and the grace to cope with whatever happens. I am wishing you the peace of the Christmas Season to trust that your “What if’s?” could all go right, too! May you find your path across any desert that you encounter. P.S. Sorry this Christmas letter got so long! I’ve attached a few fun photos of our travels.